A Kolavia aircraft was carrying 224 people, icnluding 17 children. 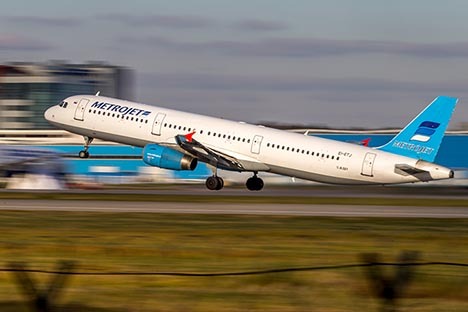 Earlier in the morning the Russian Federal Air Transport Agency (Rosaviatsiya) possesses information indicating that an Airbus A321 plane en route from Egypt to St. Petersburg disappeared from radar screens. "An A321 plane, Flight 9268, departed Sharm el-Sheikh for St. Petersburg at 6:51 a.m. today. Preliminary findings indicate that contact with the plane was lost and it disappeared from radar screens over Larnaka at 7:14 a.m. No contact with the aircraft has been established and it has not appeared on radars since then," Rosaviatsiya spokesperson Sergei Izvolsky told Interfax. The plane was carrying 224 people, including 217 passengers and 7 crewmembers. All passengers on board a Kolavia aircraft are Russian citizens, the Govorit Moskva radio station reported with reference to a source from the Russian embassy to Egypt. UPD at 1:00 p.m.: Russian President Vladimir Putin has instructed Prime Minister Dmitry Medvedev to put together a government commission to probe the crash of a Kogalymavia passenger aircraft in Egypt, the Kremlin press service reported. UPD at 1:13 p.m.: Vladimir Putin has offered his sincere condolences to the relatives of the people killed in the crash of a Kolavia aircraft in Egypt, the Kremlin press service reported. UPD at 2:00 p.m.: Russian Prosecutor General Yury Chaika has ordered starting an inquiry into the crash of a Russian passenger aircraft in Egypt, Prosecutor General's Office spokesperson Marina Gridneva told Interfax. "At Russian Prosecutor General Yury Chaika's instruction, the Northwestern Transport Prosecutor's Office has started an inquiry into the way the law on flight safety has been observed in the context of the crash of an Airbus A321 aircraft of the Kolavia airline," Gridneva said. UPD at 2:10 p.m.: According to Reuters, Egyptian search and rescue team members have found more than 100 bodies, including those of five children. UPD at 2:20 p.m.: Sinai is the scene of an insurgency by militants who support Islamic State, according to Reuters. The rebels have killed hundreds of Egyptian soldiers and police and have also attacked Western targets in recent months. Though Egyptian authorities do not believe that terrorism is not the cause of the crash. UPD at 4:30 p.m.: U.S. Secretary of State John Kerry, who is visiting Kyrgyzstan now, has offered condolences on the crash of a Russian passenger jet in Egypt causing numerous fatalities. UPD at 5:45 p.m.: The Russian Embassy in Egypt officially confirmed that that there are no survivors in the Kolavia plane crash. "Unfortunately, all passengers of the Sharm el-Sheikh-St. Petersburg Kolavia flight 9268 died. We offer condolences to their relatives and beloved ones," the embassy said in a statement on Facebook. UPD at 9:15 p.m.: The criminal case has been opened under Russian Criminal Code Article 263 (violation of rules of safe operation of railway, air, marine, and inland water transport), spokesman of the Russian Investigative Committee Vladimir Markin told Interfax. Later the Committee opened a second criminal case over the crash for the crime defined under Article 238 Part 2. "Currently, as part of the investigation of this criminal case the investigators of the Moscow Interregional Investigative Directorate on transport of the Russian Investigative Committee are conducting searches at the offices of the Kolavia airline, as well as Domodedovo airport where the plane is registered," Markin said. "During the searches the documentation related to the activity of the air carrier, operation and technical maintenance of the plane will be confiscated. By means of it the investigators will establish whether or not the plane and its crew were fully and correctly prepared to provide the services of shipping passengers. Meanwhile, the investigators are planning to interrogate people involved in the work to prepare the plane and its crew," he said.